Bake, bake, bake! Use whey instead of water or milk in bread (like this whole wheat Pullman, a favorite in our test kitchen, or a loaf of challah), pancake or waffle batter, cornbread, flatbreads (Panfusine makes roti and paratha with it), pizza dough, and quick breads. We love these molasses biscuits, which also call for whey. 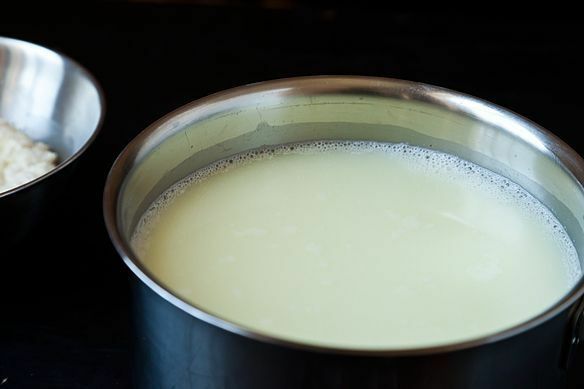 Whey also makes a great substitute for milk in béchamel sauce. Add whey to boiling water for pasta or potatoes (or replace all the water with whey), says petitbleu. Or make your morning oatmeal or grits (or polenta, or rice) with whey. And then mash those whey-boiled potatoes and thin the mash with some more whey. Use whey as a marinade for meats. Whey makes for a very refreshing drink (many people drink it post-workout). Gulp it down "neat" for a tangy drink, or add a bit of honey, maple syrup, or juice—or add it to a smoothie. You can also add it as part of the liquid in a pot of soup or stew. AntoniaJames likes to make Merrill's saag paneer with whey. Thesugarchef turns whey into dessert: She both caramelizes whey and freezes whey into sorbet. Try pickling things in it! This is called lacto-fermentation. If you have whey way more than you think you'll use in one go, pour it into a plastic container or jar (or ice cube tray) and pop it in the freezer to use gradually. Or, says Savorykitchen, water your plants with it! Want more ideas? The Hotline has lots of whey-cool discussions about whey. What are your favorite ways to use up whey? Weigh in in the comments. I make homemade yogurt and strain it for thicker, greek style yogurt and am left with whey that I've been throwing out!!! Wondering...does anyone know how long whey will last in the fridge before I use it? hi diane! it should last about a week in the fridge (but you can freeze it if you want to use it later). Whey is great in rice pudding, too!! Awesome tips here and thanks for that. I've been using it in my morning oatmeal and really like the subtle tang it gives but I never would have thought to add it to polenta and I'm going to try that next - sounds like a great idea. But I have a question for the bread bakers - I use whey in lots of quick breads but I've been reluctant to use it in a lot of breads with long fermentation times (I do a lot of 18-hour no knead type breads) for food safety reasons. How long is it safe to leave a bread made with whey to rise at room temperature? As noted above, use it for boiling potatoes - and then save the potato-starch-rich cooking liquid to use in bread - which gives you the double bonus of two of bread's best friends. It will produce quite a fine loaf, and can be used in any recipe that calls either for milk or water.